Letters from ship owners and masters convinced the Government that the Marine Police protection policy was working as a deterrent and essential. Some of the letters were from importers, ships masters and wharf owners who, although outside the scheme nevertheless had found that with just the presence of boat patrols passing and the quay guards present around the clock deterred depredation from dishonest stevedores and petty thieves who pilfered from the quays. Thames Police rowing galley around 1900. On 28th July 1800 Parliament passed the Marine Police Bill moving the small river force from the private to the public domain, and increasing its members to 88 officers and waterman. They were taken with the Magistrate John Harriott to be directly under the control of the home secretary, who used their hard won experience through-out the whole of the Metropolis until such times as the Metropolitan Police were formed. Patrick Colquhoun published in 1800 a book entitled 'The Commerce and Policing of the River Thames' and as the only police body extant whole chapters were included about criminals of the Thames, its policing and the effect. The book was widely read and approved of, so much so that many other police forces were formed through-out the world on his principles, the most famous being Dublin, New York and Sydney Australia. He died in 1821. 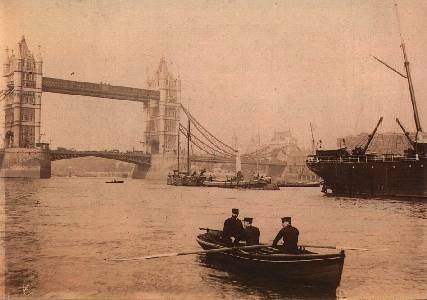 By 1829 when the Metropolitan Police Bill was passed, the river police had grown in numbers and stations, with two old naval vessels to extend their boat patrol areas to above Chelsea and down to Woolwich. In 1817 an excise 'Cutter' was purchased to patrol the lower reaches as far as the Downs, firstly to protect the Kings stores at Sheerness, a Magistrate with powers in the surrounding counties was then essential to empower the River Police to prevent such crimes and in particular crimping. Winter for the officers patrolling in open boats was most rigorous. The Metropolitan Police was allowed 10 years to establish itself, so in 1839 the whole of the Metropolis had a police unification (with exception of the City of London Police force which founded in 1834 remains a separate body to this day) The Commissioners at the time Sir Richard Mayne and Sir Charles Rowan were empowered to control, under the Home Secretary, all other police bodies in London, including the Bow Street Runners, Horse patrols and the River Police. There being no further requirement for the magistrates to control the boat patrols and investigate river crimes, the unique Thames Magistrates Office was moved to Arbour Square and renamed Thames Magistrates Court. Thames Division of the Metropolitan Police was built on the officers and experience of its earlier force. It was always suggested that the land police were formed (and indeed their uniform suggests it) on the pattern of an army regiment and the River Police on the pattern of a Royal Navy 'man of war' (Hence their reefer jackets and naval boaters). For the next forty years the rowing galleys and sailing patrols continued and were found adequate, while the river trades slowly became merchandised and to a large extent iron replaced wood. In 1878 the loss of over 600 lives in the disastrous collision between the paddle steamer 'Princess Alice' and the collier, 'Bywell Castle' made it obvious that at least some powered craft were necessary. To learn more about the Princess Alice disaster click here. In 1884 two steam launches were purchased for supervisory purposes and later a third was found necessary. Continue to the next section to learn more.